Jenny’s exhibition has just started at Erwood Station Craft Centre, in the new carriage gallery. It will be open every day from 9.30 to 5.30 until 18th August, and she will be demonstrating there on 23rd July – see the events page. Set in the lovely upper Wye Valley the centre makes a lovely day out to see arts, crafts and beautiful countryside. Michael Cunningham is taking the Centre from strength to strength. This, of course is Llandoddie land, so be prepared for mysterious happenings, such as the cat changing colour. The exhibition features paintings from Jenny’s new book, Painting With Pastels, published by Search Press, and shows the great versatility of the pastel medium. 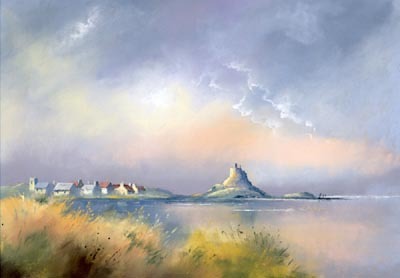 In her painting of Lindisfarne, seen above, I love the soft blending of the foreground vegetation into the sea, together with the variegated colour and the occasional blob. It is so easy to over-work a foreground, but one of her lessons here is to show how to understate this vital part of a painting. We sketched this scene together on a beautiful evening, looking across at the incoming tide, so I’m not surprised that she has emphasised the romantic nature of the moment, and it is this sense of mood, whether emotional or physical, that can inject that marvellous added ingredient to lift the painting beyond simply a graphic record of the moment.